The "Amati violin" is finished now. This little tiny bird a "Verdin" frequents my backyard. He likes to sip from my hummingbird feeder or feeds from the bottle brush tree nearby when it is in bloom. This "bird" is so small and sweet. The "Verdin", I named "Vernin" is almost as fast as a hummingbird. It used to be quite shy, but now lets me get rather close through the kitchen window to photograph. 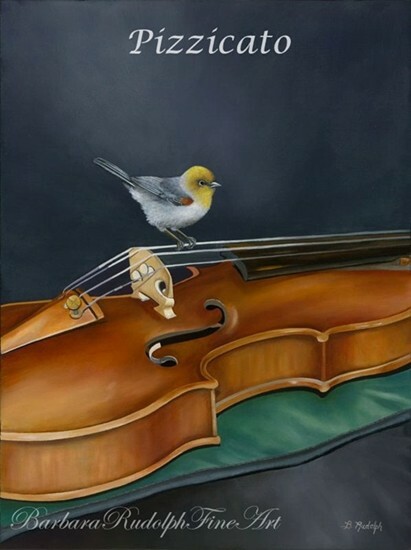 I decided he would be the perfect "bird" to sit upon the strings of my "Amati violin" oil painting." This oil painting measures 16x12" and I will have it professionally framed for my show later this winter at the "Celebration of Fine Art" in Scottsdale, Arizona. If you have any questions about this painting or would like me to paint "your own instrument" please contact me. You can also scroll down a few posts to read about this amazing instrument and the "Wyatt Violin Shop" as well as the beautiful and talented girl that played it. I would love to hear your comments. Just click on the comment link to leave one. Great painting! I love that you titled it "Pizzicato". For those who don't know, pizzicato is the act of plucking the strings rather than playing them with a bow as in classical music.